Joy Creek Photo Archive (c) all rights reserved Fuchsia 'Surprise' bears periwinkle corollas with dark rose recurved sepals. Very hardy for the Pacific Northwest. Late spring to frost. 5 ft. x 4 ft. In the maritime Pacific Northwest, we grow hardy Fuchsias in full sun where they bloom non-stop from late spring to first frost. 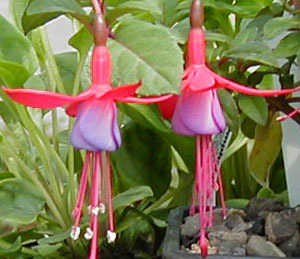 In hotter climates, we recommend giving Fuchsias protection from the afternoon sun. Fuchsias make wonderful subjects in containers and for the mixed border.